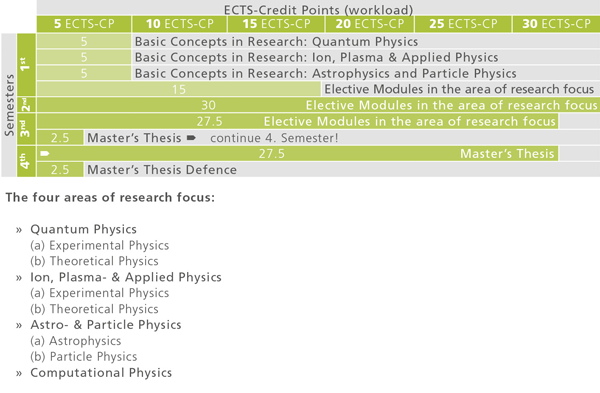 2.5 ECTS-Credits: Master’s Thesis › continue 4. Semester! These specialisations can be deepened by a wide range of elective offers. The study programme is concluded with a master's thesis, a resarch paper in a relevant field of physics mentioned, which is included in one of the approx. 30 working groups. Graduates possess highly specialized knowledge in one of the specialisation areas (quantum physics, ion/ plasma/applied physics, astrophysics and particle physics or computational physics). They are able to apply their knowledge at the intersections of related sciences by independently formulate and substantiate scientific arguments and to find innovative solutions to problems. The career fields of the graduates of the Master's Programme Physics are in particular natural science and technology, both in industry and research. Occupational profiles of graduates of the bachelor's programme can be found in fields of science and technolgy where problem-solving capacities and independent implementation of projects are required. Moreover, these activities are also demanded in other fields (e.g. project management, consulting and banking).